My son is really getting into building ship models made of plastic and metal. 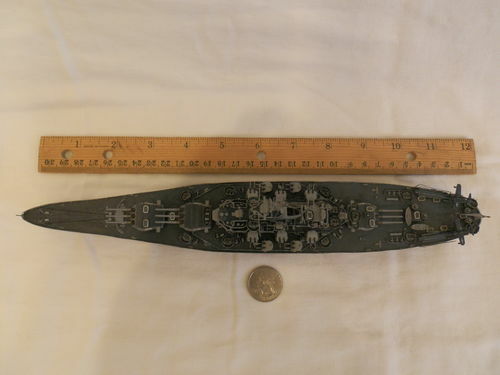 For instance, he is just about finished with a 1/700-scale USS Massachusetts made from thousands of pieces including a brass detail set. He is interested in learning to use an airbrush on his next project. A friend gave him this brush. We are looking for recommendations for a compressor (and tank?) to use with this type of brush. Chuck – I would really like to see your sons model after it is finished. that can maintain a consistent air flow anywhere from 5 to 35psi to the brush. many people use those little cigar compressors that are LOUD and never stops until you are done. they are about $60 on E-Bay. or search C/L for a used one. I have seen airbrushes run off of old air tanks filled up at the gas station for the air supply. an airbrush uses very, very little air volume to operate properly. 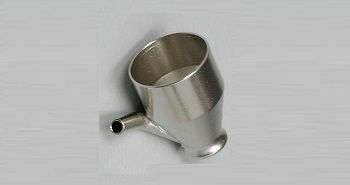 start looking around on E-Bay, C/L, art stores, etc for spare parts and extra media cups. 6 media cups would be a good starting point for the beginner. Since your son has become interested in model building and finishing he may want to look at the Micro Mark website. The Paasche H is a good brush to start out with, it can’t really make fine lines though, for that you need a dual action internal mix brush such as the Paasche VL. I paint RC Car bodies, and have found great utility in a 1 Gallon Campbell-Hausfield compressor from Walmart. One of the small compressors from Harbor Freight should good a decent job too. One thing is needed is a moisture trap no matter what compressor he uses. It’s a beast of a little compressor with an induction motor and is pretty darn quiet… I’ve used it with all of my brushes from the cheap little HF thing I mentioned above, to my outrageous Paasche AB Turbo (google it!). That compressor is more geared towards stuff like running a nailer on a job site, and you are correct, it is loud. The HF compressor I mentioned is designed for airbrushes. They actually have two, one is a 1/6hp for around $60, and another one that is 1/5hp and comes with an airbrush, regulator, hoses, etc... (ie: a complete setup) for around $70. That one, as far as I can tell, is pretty much identical to the Paasche D500 except for the color. 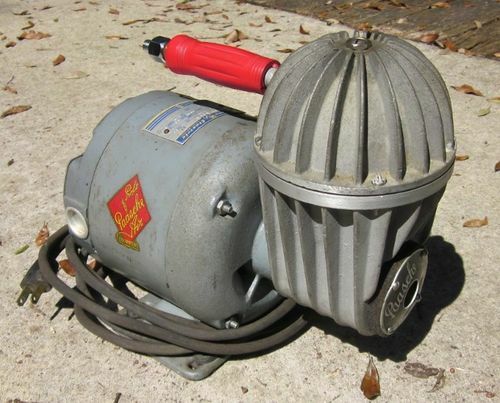 Amazon has the bare Paasche compressor for sale (no regulator, hose or anything else) for a bit more than $80. We have this compressor. Should this work with the addition of a regulator? 1. Oil compressors are excluded. 2. Water trap filter is a must. Depends, I find siphon feed requires a lot more pressure than gravity feed. The viscosity of the paint you use has a lot to do with it too. I was a professional taxidermist for around 20 years until I realized that I was burning myself out and didn’t get to hunt or fish myself because of being busy. During that time, during many conventions, there were many seminars on different airbrushes and their use. Everything above said about the H and VL Paasche series is true. When going to finer lines with less pressure and thinner paint you will have to change needle sizes, simply done. They both work well with solvent and water based paints. Hydro Mist is an excellent water based paint that is excellent with so many different colors it’s mind boggling, it also dries just about instantly when sprayed on a project, so no wait time between coats or colors. Cleans up with water but when dried it takes acetone or its own thinner to clean. You might look up the Aztek line of air brushes. They are the simplest to switch around and by far the easiest to clean. Tips just change out for different patterns and paint types. No internal cleaning of the airbrush itself, just the tips. I still have an H and two VL series along with the Aztek set-up. 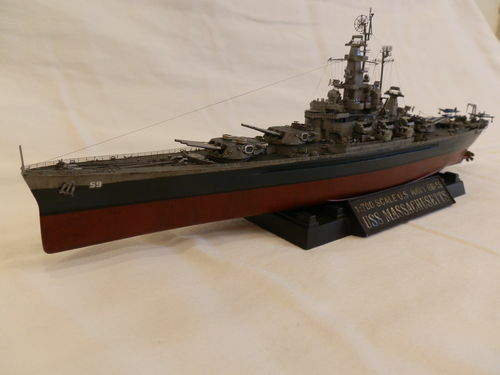 Here are a few photos of the USS Massachusetts in 1/700 scale. 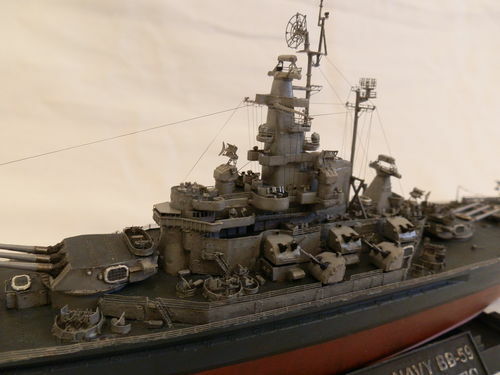 He did an amazing job adding many touches such as weathering and rigging. Last year, we visited the real thing in Fall River! holy kow – WOW !!!!!! very very impressive !! my hat is off to your son. that will portray history for a few more generations. Nice detail on the boat.